Former Arsenal midfielder Fabrice Muamba has revealed tonight that he has a ‘soft spot’ for their north London rivals Tottenham. The 31-year-old, who is perhaps remembered best for his spell at Bolton before being forced into an unfortunate early retirement, spent five years at Arsenal, coming up through their youth academy before making two appearances for the senior side. However, Muamba celebrated Tottenham’s goal against Manchester City tonight in their big game in the Champions League clash. When taken up on it by an Arsenal fan on Twitter, Muamba responded that he has a soft spot for Spurs. It’s not clear why this is, though it’s worth noting that the former England Under-21 international suffered his cardiac arrest in that FA Cup clash for Bolton against Spurs in 2012. 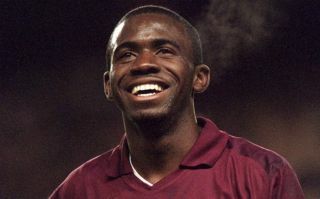 Muamba will no doubt have received help and support from Tottenham that night, so it could be that that has now led him to occasionally cheer them on as well as his first club.